This See by Chloe bag is a must-have for your busy on-the-go lifestyle. Plus, the stylish gold charms add an extra touch of sophistication. Also available in Skylight, Powder Pink, Black, Beige, Ultramarine, Pineapple, Tan, Green, and Lilac. 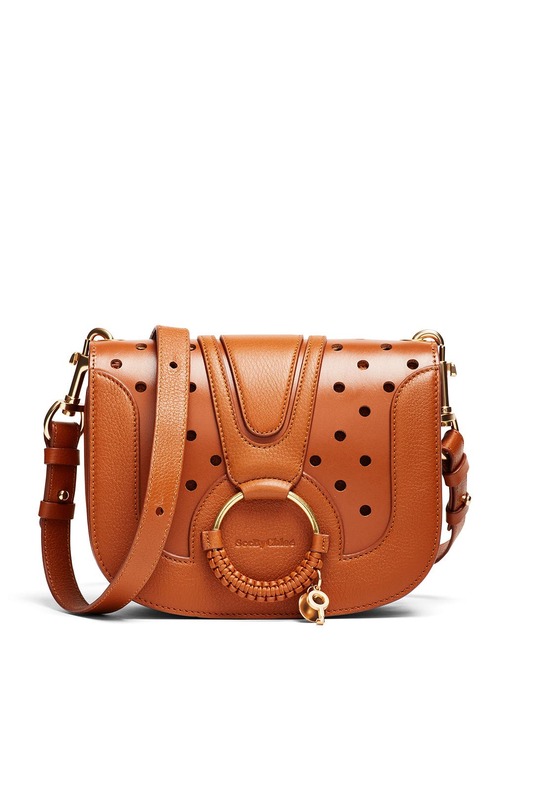 Caramel leather gusseted crossbody bag with polished gold-tone hardware and perforated front. Magnetic flap closure and adjustable crossbody strap with a 14"-20" drop. 9"W x 7"H x 2"D.
Love this bag. Rented for a trip to Napa and ended up keeping it much longer for everyday wear. Great size - not too big but big enough for wallet, sunglasses, keys, etc. Highly recommend! Very cute crossover. Fits iPhone 7+, wallet, keys, sunglasses and several other small items. Inside has two main sections and a flat central section. No outside pocket in the back. I find the strap to be a little shorter than most crossbody bags of this size but not too short to still wear in that way. Has adjustability to become a shorter strap. Can't seem to return it because I love it so much! Perfect for day or night. Great purse that holds a good amount and is beautiful and soft. I've had it two weeks already on my unlimited plan and can't bring myself to Wendi t back! Super stylish bag with great leather and beautiful details. The bag still smelled brand new! The smell of the leather filled the whole car! I was able to fit my large wallet, iphone7+, and lip glosses and glasses (although it was tight). Perfect for a day in the city or everyday use - loved it and would rent again. Super cute bag and great color!! But if you're tall wearing this bag will be somewhat awkward because of the strap length. 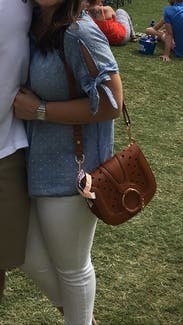 They don't adjust and at 5'8, trying to wear the bag as a cross body meant the bag hit in the middle of my back vs. my hip area. Didn't use it.... sent it back next day. Great bag, great size! 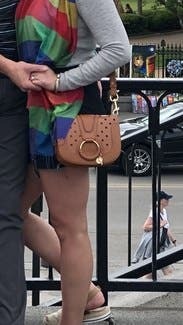 The only funny thing is that the hardware made a lot of squeaky noise when wearing it cross body- so it was a little awkward in quiet places (felt like I needed to hold it away from my body so it wasn't causing a distraction). This is the first item from my unlimited subscription that I have held onto for months. I absolutely loved this bag. It was the perfect size and was able to hold my iPhone 7 Plus and other items. The color was great and matched perfectly with all of my every day outfits. I would highly recommend this rental and hopefully I will be able to purchase. Love the design and keaghwe quality. Fits my iphone plus, some makeup, wallet, keys. Perfect bag for everyday. Its small but does fit phone, wallet, and makeup essentials. I love it! 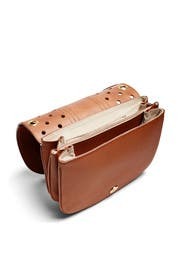 Love the details and color in this clssic saddlebag. Going to keep for a while and would def rent again! I was very excited about this bag but just did not like it. Carried it shopping one day and then returned. Was a little too large and something about the hardware was a little too basic. Also this is very much a cross-body. I prefer to wear bags on my shoulder and the straps didn't really suit themselves to that. Straps too short for anyone 5'7" and above! 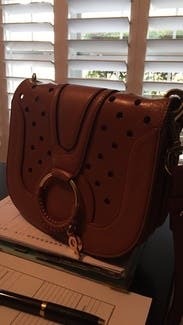 Super cute purse BUT the strap is short. It was weirdly sitting high on my hip. I am 5'9" so if you are 5'7" or below it prob will work for you. Otherwise gorgeous purse, sad it didn't work out. Straps are adjustable btw but not long enough. This is a really cute and well-crafted bag, but it's tiny. The button also requires two hands to close. I didn't close it properly and my lipglosses all fell out of the bag. It's also not a crossbody bag (the straps are too short) so it's a shoulder bag, which is fine. It was cute but not a long-term rental for me. I only wore it for a weekend and will send it back for another piece. This bag is perfect! Gorgeous tan leather with heavy-duty hardware. Perfect size for everyday. Loved it! Will def rent again. 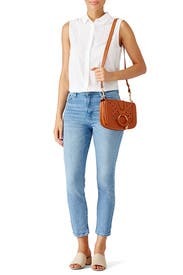 This is a great cross body, that goes with every day outfits. Plenty of room for wallet, iPhone 6plus, makeup and keys. Perfect size - goes with everything! I rented this messenger bag for a girls weekend and it was perfect. Went easily from casual to dressy. I wore it for 5 days straight and it went with everything. This held more than I thought it would and the leather is high quality. It didn't fit my standard wallet but it was a very cute purse! I have this bag in a version more suited to fall, so I knew it'd be great for a neutral outfit. Nice daytime bag, can easily fit two smartphones, lipstick, keys, and a small wallet. Mine arrived looking a little worn, so it wasn't something I would have purchased, but I enjoyed using it. Four stars. Love this bag! It fit my long wallet, my phone and lipstick - perfect. I love a bag where I can be hands free and fits all of my stuff! love. 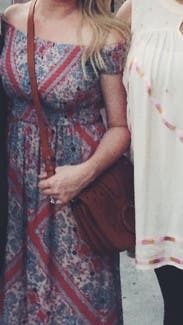 wore on vacation with a lovely brown sandals and floral outfit. Perfect size not too big but fit all my stuff! very cute, well-organized interior dividers. I really like the light-color interior and the way the interior pockets work. The color was a teeny bit more orangey than I expected but very nice leather. a little short in the strap. Great size because fits one or two iphones, plus so cosmetics, wallet etc but isn't too big. Good for day and night, goes with every color, strap was perfect length. Good for many occasions except super fancy! Great versatile bag, nice leather color too. This was a great size for a day bag! It was so classic and rich looking. I really enjoyed using the back and really thought hard about keeping it but I can't see myself spending so much money on a casual purse. i would 100% recommend renting this!